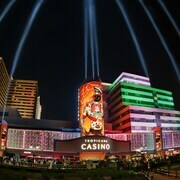 Exploring Atlantic City casinos. Opens in a new window. Atlantic City Boardwalk. Opens in a new window. Eating around Atlantic City. Opens in a new window. On the weekend the breakfast was filling. Coffee was good with regular size coffee cups, not the small styrofoam type. The weekday breakfast could have more variety. Maybe add Hot cereal, eggs and sausage, danish as well. Overall the property has improved. Where to find Atlantic City hotels near an airport? 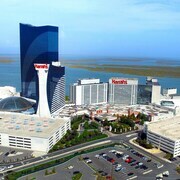 Where can I find hotels in Atlantic City that are near tourist attractions? If you're traveling through the Jersey Shore area and you're looking for a place to stay in Atlantic City, you have a wonderful list to select from. Within Expedia's handy booking pages you can find 59 accommodation choices within 0.1 kilometres (0.06 miles) of central Atlantic City. 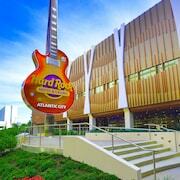 Finding a room close to the heart of Atlantic City is only a few mouse clicks away. Expedia's up-to-the-minute database lists the Wyndham Skyline Tower and Marriott Courtyard Atlantic City, which can be found within 1 kilometre (0.6 miles) of the city center. Atlantic City Boardwalk is an excellent neighborhood in which to base yourself as it has 14 Expedia-listed accommodations. Atlantic City Boardwalk is 2 kilometres (1 mile) from the middle of Atlantic City. 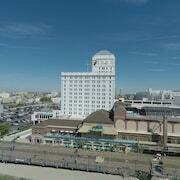 Establishments in Atlantic City Boardwalk include the The Chelsea and Carisbrooke Inn. An alternative area to stay is Absecon , situated 9 kilometres (6 miles) from downtown Atlantic City. There are 13 establishments in Absecon, including the Holiday Inn Express & Suites Absecon-Atlantic City and Red Roof Inn & Suites Atlantic City. Another popular place to stay is Somers Point. Somers Point is where you'll find the Sonesta ES Suites Somers Point and Econo Lodge Somers Point. Or, you could try Ocean City, where you'll find the Forum Motor Inn and Biscayne Suites. The Quality Inn Pleasantville and Comfort Inn & Suites West Atlantic City are situated in Pleasantville, and Rodeway Inn and Boulevard Motel are part of the Marmora area. At Expedia, we know that travelers possess different requirements and budgets. So if you're seeking a hotel or appartment at the budget end of the range, Atlantic City boasts some nice options to choose from. 13 kilometres (8 miles) away from Atlantic City's downtown you'll find the Liberty Inn Atlantic City. The Rodeway Inn is only 14 kilometres (9 miles) away. The Quality Inn Flamingo and the Knights Inn Atlantic City are some other affordable hotels well worth looking into. 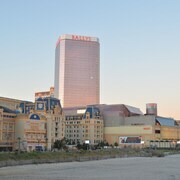 The Marriott's Fairway Villas is positioned 11 kilometres (7 miles) from the center of Atlantic City. Another hotel is the Watson's Regency Suites, which is situated 16 kilometres (10 miles) away. The La Sammana Resort and the Blue Water Inn are two other recommended accommodation options worth looking into around Atlantic City. The broader Jersey Shore region is definitely worth discovering as well. If you love nature, be sure to explore Jersey Shore's beaches and coastal plains. In addition you could spend time at some of the area's lighthouses. Popular pastimes in this part of United States of America include four-wheel driving and cycling. Looking for things to do? Consider spending a few hours enjoying Raging Waters and Cape May Winery, in Cape May - Wildwood, 55 kilometres (33 miles) to the southwest of Atlantic City. Should you wish to spend a few nights in Cape May - Wildwood, be sure to check out the Hotel Icona Diamond Beach and Beau Rivage Beach Resort. 95 kilometres (60 miles) to the north of Atlantic City, you may also choose to stay at Freehold, home to the American Hotel and Radisson Hotel Freehold. The Freehold Raceway Mall and Charleston Springs Golf Course are just some of the more popular points of interest to explore when you're in Freehold. Atlantic City International Airport is a convenient airport for flying in and out of Atlantic City. It is 16 kilometres (10 miles) drive away. If you choose to stay nearby, try the Homewood Suites by Hilton Atlantic City/Egg Harbor Township or Country Inn & Suites By Carlson, Absecon, NJ. 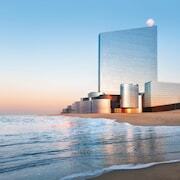 What are the most popular Atlantic City hotels? 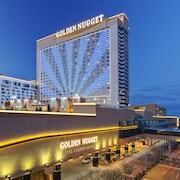 Are there hotels in other cities near Atlantic City? 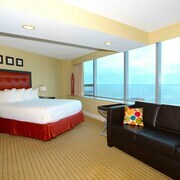 What other types of accommodations are available in Atlantic City? 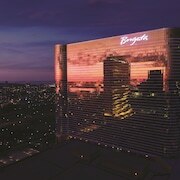 Explore Atlantic City with Expedia.ca’s Travel Guides to find the best flights, cars, holiday packages and more! Flights from Macdonald Cartier Intl. to Victoria Intl.